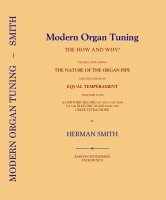 Description: This book explains the technique for tuning the pipe organ, together with the details of setting the scale with equal temperament. Also included is the history of the musical scale and how it was derived. Smith, Hermann. Harmonium builder; clerk in piano trade. Author of “Modern organ tuning: the how and why, clearly explaining the nature of the organ pipe and the system of equal temperament”, 1902; “The Making of Sound in the Organ and the Orchestra”, 1911. b. Maidenhead, England, 1824; d. Hampstead, 1910. SECTION I. - THE PURPOSE AND THE PLAN. - The Choice of Treatment. My audience. The Plan of the Work. SECTION II. - THE ORIGIN OF THE ORGAN. - In the Early Days. The most Ancient Organ. Pipes more Primitive than Strings in Music. The Voice the first Measurer. The Enquiry into the Origin of the Organ. Pythagoras Quite in the Dark. Step by Step the Diatonic Scale developed. SECTION III. - THE BASIS OF THE MUSICAL SCALE. - The Beginning of the Scale. Evolution of Music as a System. The System of the Tetrachord. The Earliest Forms of the Tetrachord in Evolution. The Man's Voice the Guide in fixing Pitch. The Laws of the Tetrachord in Use. THE HISTORIC RECORD. - Foundation of Athens. The first Tetrachord. Terpander, Olympus, Anacreon, Pythagoras. Ion the Author of the Conjunct System. The Rise of the Aristoxeneans, and the Plan of the Greater or Disjunct System. Eratosthenes, Didymus, and Claudius Ptolemy. Review of the Scholastic Systems. Chance the good Genius of Science. SECTION IV. THE OUT-OF-TUNENESS OP THE ORGAN. What is the Use of Tuning it? Weight of Air Particles in the Organ Pipe. The Original Voicing of the different Stops. Dust the Great Enemy. SECTION V. - THE NATURE OF THE ORGAN PIPE. - The Capture of a Column of Air. My Theory of the Speaking Process in an Organ Pipe. The Air-reed doing an Amount of Work. Velocity of Passage converted into Velocity of Vibration. All Organ Pipes are Stopped Pipes. Sounds made Musical by Pitch. SECTION VI. - THE PRACTICE OF TUNING THE ORGAN. - It takes Two Men and a Boy to Tune an Organ. The Real Work of the Tuning Man. Learnt by Experience in the Factory. Experimental Organ Tuning for Pitch and Temperament by Harmonium. SECTION VII. - THE SCIENTIFIC PRINCIPLES OF EQUAL TEMPERAMENT. - Temperament, What it denotes. Chief Requisites of the System. The Demonstrations of the Theory. The Tuning Fork in Science the Determinant of Pitch. The Problem before the Organ Tuner. Ancient Determination of Ratios. A little Stroke of Practice in figures. The Defect of the Diatonic Scale. Mean-Tone Temperament, and the Un-equal. Cardinal Points of Equal Temperament. Tuning is Rectification of Numbers. The Beats are the only Guide. How flat is a little flat ? A Home-made Pendulum. How Rates of Beating are Calculated. Comparative Frequencies of Vibration. Table of the Philosophical Pitch for Four Octaves. To Temper is to Mistune by Rule. Tempered Minor Intervals Test the Truth of the Octaves. Proofs that the Beats have Two Relations only. The Fourth to be considered a Minor Interval. All Major Intervals beat half to Upper Minors. The Fourth is the Umpire of the Octave. The Time-Relation of the Beats. Beats of the Major and Minor Thirds proved. Selecting the Standard Fourth. Relation in Beats of a Fourth within a fifth. Phenomena of Beats described. Vibrations perceived by Time-distance only and not by Collective Numbers. SECTION VIII. - TUNING SCHEMES USED IN PRACTICAL WORK. - Laying the Beatings, and Learning the Methods. The Scheme of fifths with Octaves. Learn to Labour and to Wait. The Trial Tests by Chords. Tuning the Succession of Octaves. The Scheme by Fourths and fifths only. My New Scheme for a Learner by Octaves and Interposed Fourths. Specified Beats of each Fourth in the Chain. Progression through the Octave shewn by Table of Beats. Diagram of Time-distance of Beats. The Fourth the naturally selected Interval for Tuning. SECTION IX. - RE-INSTATEMENT - THE AIM. - The Completion of the Task. The Organ Tuner not a Free Agent. How to Proceed, by Routine. Why "The Principal" is Chosen to Rule the Tuning. How the flue Pipes are to be Identified. Similar Chords to Beat Differently in Different Stops. Beatings made only by Harmonics. The Growth of the Harmonic Series. Empiricism of the Mixtures and Compound Stops. Production of Harmonics due to Nature's Excess in Energy. The Law of Harmonic Progression. Table shewing how the Vibrations, Harmonic and Tempered, differ. The Octave Non-Existent in Music. The Unison the only Consonance. In Ultimate Analysis Sounds are Shocks. The Tuner is a Hot Iron Moving About. The Maxims of Ptah-hotep.